Up until my mid-teens, I was fairly lucky with my skin, but when I hit the age of fourteen or fifteen I started to experience breakouts which, after trying several natural remedies, eventually bothered me so much I went to the doctor's in search of a cure. My breakouts were by no means full-blown acne, and I'm grateful for that, but nonetheless it had a big impact on my self-confidence, so I was thrilled when the GP prescribed me topical antibiotics. After a few weeks, my skin began to clear up, and once I was used to how the antibiotics made my skin behave and had adapted my skincare regime accordingly, things were going really well, save the odd minor hormonal breakout. However, almost a year into my prescription the product I had been using was reformulated and replaced with an alcohol-based solution, which I quickly found actually worsened my skin; it made existing blemishes bigger and angrier and, would even cause breakouts when my skin was otherwise clear. Needless to say, once I realised the antibiotics were the cause of these new skin problems I stopped using them, and as my skin had remained clear between prescriptions, I decided not to go back to the GP. Since then I have made some serious lifestyle changes (not solely for my skin - primarily for my physical health and general happiness), and my skin has stayed fairly healthy, aside from those inevitable hormonal troubles, so I thought I would share with you some of the things that I've found help keep my skin clear and healthy, in the hopes that they will do the same for you. #2 Cut down on dairy. Now I know this isn't a tip that everyone is going to want to follow, but I really would recommend at least trying it for a week or two and judging the results for yourself. During my younger teenage years when my skin was at its worst, my diet overall was pretty poor, but I was also consuming quite a lot of dairy; big bottles of white chocolate milkshake (which even the mere thought of today makes me feel a little queasy), white chocolate cookies, lots of tea with cow's milk (and several sugars, which I'm sure didn't help either), cheese, etc. But, after going vegan for six months in 2013 and then continuing with a plant-based diet with only occasional small amounts of dairy, I've noticed a massive difference in my skin, and whenever I have gone through a period of eating more dairy than usual, I always experience congested skin and breakouts. Eliminating and re-introducing dairy into my diet really highlighted the impact it has on my body and showed me that it was perhaps one of the main causes of my troublesome skin, so now I keep my dairy consumption to a minimum. #3 Eat well. This kind of follows on from tip #2. As I mentioned, during my early teens my diet was poor; on top of the dairy, I was also eating a lot of fried food from the deli counter in the supermarket, sugary and salty snacks, white pasta with cheese, milkshakes almost every day, Poptarts and so on. All of this left my skin looking rather pale and grey; I was hardly a picture of health. But, eating plenty of fruits, vegetables, whole grains and healthy fats not only makes you feel better, but it shows in your skin; eating well means your insides are healthy, and that is reflected in your outsides through bright, glowing skin, bright eyes, healthy hair and strong nails. I'm not saying you have to adopt a diet that doesn't suit your needs or tastes, but simple things like adding a sliced banana to your breakfast, snacking on fresh fruit or dates dipped in nut butter, swapping regular pasta and bread for wholewheat and adding some fresh salad or steamed/roasted veg to your afternoon and evening meals can make a big difference not only to your skin, but also to your energy levels and overall mood. #4 Exercise. Like drinking water, getting sweaty helps your body flush out toxins and any substances it doesn't need, thus keeping your system and your skin clear, but you don't have to go to a sauna to achieve this; regular exercise should do the trick (although that's not to say saunas are a no-go - after all, we all love a good pamper). The exercise you do is up to you, but I recommend a mix of cardio and strength training over several sessions each week, with the aim of getting at least a little sweaty every time, particularly on your cardio days. I love to alternate between the two, and usually do HIIT for cardio and yoga, pilates or bodyweight exercises for my strength training, although I am hoping to get back into weight training soon. If you're new to exercise, try out as many different things as you can - try the gym, go to a few classes, find some fitness accounts on Youtube (I love Fitness Blender and Tone It Up) and try following a few of their videos, go for a run - just find what you enjoy and what makes you feel good, then fit it into your schedule. #5 Invest in your skincare, and keep it simple. This is a more recent one for me, but it's made a noticeable difference to the overall look and feel of my skin. I've tried many different skincare regimes and combinations of products over the years, but I think I've finally settled into a routine, and it's so simple. Consistency is important for your skin as chopping and changing your routine and the products you use too often can confuse your skin and lead to aggravation. For me, a simple cleanse, tone and moisturise routine in the evening, and a gentle scrub followed by the same moisturiser in the morning works well for me, along with the occasional face mask or more thorough scrub. 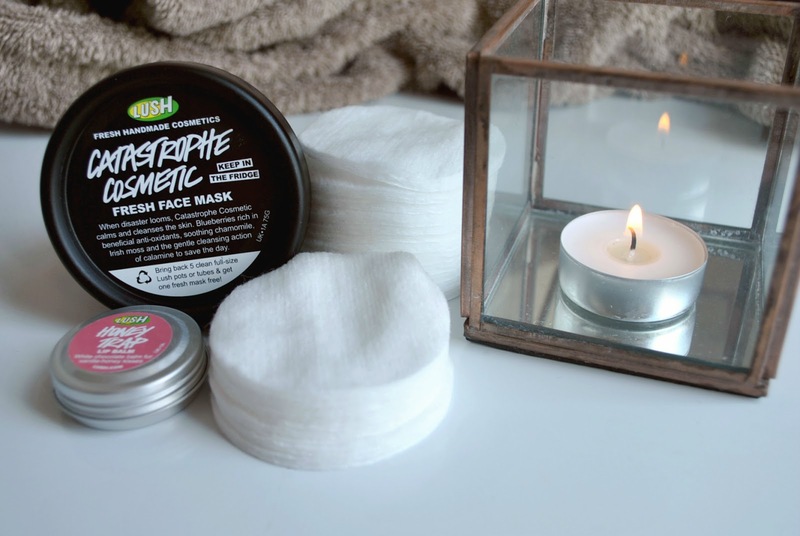 All of the products I use are from Lush, so they all have simple, recognisable ingredients which are predominantly natural. What works for you might be different - you know your skin better than most - so find the base products that give you the best results and keep your skin happy, stick with those, and eliminate any unnecessary steps. My motto? Simple is best. Those are the top five things I've learned over the past few years which have helped keep my skin healthy and happy, and although I think they're pretty standard tips, it never hurts to share your own experience and what you've learned from it. I hope this post has outlined a few simple things you can do to improve your skin, and I hope they work as well for you as they do for me. Had a little look at your latest post - looks like you had an amazing time in Wales. The scenery is stunning!